Hey guys glad to be back with Slider set v4.0 the main focus of this set is to bring the fun back to 2K so the user offense is "strong" I personally take a lot of stepback and contested 3 point shots so I have my user 3pt rating at 48....if you play more traditional / organized basketball and only take wide open shots you will probably need to drop this down to 46 or 47. One of my biggest goals with this set was to have the runs that both the user and the CPU go on feel organic and not scripted. I achieved this by zeroing out the Consistency sliders for both sides and it just puts more of an emphasis on making shots to get hot. With that being said missing shots can be troublesome and can result in your team going cold pretty quickly so keep that in mind as well! Last but not least guys if you're gaming make sure you're having fun! Remember Sliders are just a GUIDE to get you to YOUR perfect version of 2K! These settings are not the end all be all so feel free to make your own adjustments, and if you do let me know what you did and how it worked out for you! Stay Blessed! Game Difficulty - Hall Of Fame (Custom) * MAKE SURE TO start on HOF then begin to make changes. Last edited by ShadyMikeGaming on Mon Mar 25, 2019 5:29 pm, edited 8 times in total. 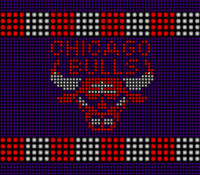 The game this year could use your help. It doesn't havn't the same blow by issue as last year, so that should comfort you quite a bit. As always, good to see you and appreciate the efforts! Welcome back, I was looking forward for these! why movement sliders set at default? So can somebody explain to me the "real player %" thing for shooting? Doesn't this mean that it doesn't matter how you release it, it goes by the real players FG% (as it relates to its attributes?) Or am I misinterpreting it. Dee4Three wrote: So can somebody explain to me the "real player %" thing for shooting? That's exactly what it means. The idea is that Korver will shoot closer to his field goal percentage, while Roberson will shoot closer to his. If you're using the meter, in theory, someone could consistently stroke Roberson's threes if they got the timing down exactly. But that takes skill out of the game, it makes the skill gap much smaller. Getting a green release every time is almost impossible, especially when the shot is contested. And, it still goes by the attributes when it's set to "timing". In the seasons I've played over the years, I've always had it set to timing, and the good three point shooters have good percentages, and the poor ones have poor percentages. It's never deviated from that. Have you seen the shot meter for poor shooters? No way anybody masters that. Not only that, why not just play with the shot meter off? I've never used one. It's awesome that they have the shot meter option, but it takes away from the realism and immersion for me, and it also creates less of a skill gap as well. I understand why he put them in his sliders, but as someone who thinks timing on shots is a skill in the game that someone should be good at, I wouldn't use real player %. Dee4Three wrote: But that takes skill out of the game, it makes the skill gap much smaller. Getting a green release every time is almost impossible, especially when the shot is contested. And, it still goes by the attributes when it's set to "timing". It doesn't take the skill out at all. What it does is make the game more realistic. Yes it is possible to learn a bad players shot release and master it, it's incredibly unrealistic and for us who are wanting a real simulation experience we see the shot meter as cheesing. The real skill in the game is using real player % and knowing who and who should not take a shot in any given situation. It's knowing that there's always a chance no matter how open you are that you can miss (good NBA shooters miss open shots all the time). It's a skill in knowing who is guarding you and how close they are and knowing that it would not be wise to take that shot. It requires real knowledge of basketball and players which in itself is a skill. I've played both ways and I got tired of using the shot meter years ago because having multiple players shooting 70% for a season is absurd. I'll take 40% over 70% any day because I have a passion for a realistic basketball experience. If you want to use the shooting stick that's up to you, but it's best used in MyCareer/PvP. If you use shooting stick against the AI then it's far too easy to win. I for one don't enjoy going 82-0 every season, it's boring. As far as the slider set goes, it feels pretty good. I still feel like the AI is shooting too high of a percentage though, I've never had a game where they shot under 50% and 60% games are becoming common. Meanwhile my personal shooting percentages are in a good spot I'm getting around 42-48%. AI opponent defense definitely seems much better than our teams AI defense. Many times the AI walks right by my AI for an easy drive. I'm not sure if this is fixable via sliders though but we can try. Rebounds have been fairly equal overall, as have steals/blocks. I've not noticed me or the AI specifically dominating any of those categories. Lack of fouls is still a thing, as it has been for like a decade now. They will probably never fix this. I think I'll wait for another tweak or two before jumping into MyGM. I don't use a shot meter, as I stated before. I've never used one. And yes, it does take some skill out of the game, because if I'm understanding right, it doesn't matter how you release it at all. So you could do a release on your way down almost hitting the floor, or a flick, and it would have the same chance of going in, which goes against real basketball physics. The timing/release in real life is vital to being a good shooter, so is form in some cases. All of that is thrown out the window with real player % turned on. So I don't think it's a question if it take SKILL out of the game, it does. If you are trying to say it takes more knowledge to use real player % (as in, real knowledge of the game) that's not true, either. As again, every season I have played with timing as the choice, the poor shooters shoot poor, and the good shooters shoot well, because the attributes still matter, and it's much harder to hit an open shot with a poor shooter because not only is timing much tougher, but his attributes factor in. You still have to know the NBA, you have to know your players and what they are good at. You still have to know how much space you have for a good shot, you have to know the same things as "real player %" but also how the player shoots, and time it right. Not only that, when shots are protected/heavily guarded, the release is different for players in the game and in real life, you have to know when to release the ball when your player goes into that animation (just like in real life you have to adjust the timing of your release), but in real player %, it doesn't matter how you release that wild contested shot, because the percentage chance of it going in is decided by the game (the real player % average on contested shots) and doesn't include any of your input as a player. Same as layups, where in real life how you time your release on your layup impacts your result greatly. With real player %, it doesn't matter how you release it, it Wil just go by the players averages, taking some skill and focus out of your layup. Like in my prior example: attributes still matter on layups whether real player % is off or on, and being contested impacts the result no matter what, except your now taking the timing/release skill out of the equation. So it takes away from layup skill as well. Having the game decide whether it goes in or not based on the real player %, disregarding anything your do with the timing of the release, is absolutely making you as the player not have to do as much, it takes less skill. But go for it, ShadyMikeGaming is good at what he does, and people will like his sliders. If you prefer real player %, use it. But it absolutley does take some skill out of the game. You can't say "it doesn't take skill out of the game" when the fact is "the game decides if the shot will go in, and your release doesn't matter". You can state that you think it makes the games percentages more realistic, so the end game stats. But you can't state that it doesn't take skill out of the game. I'm not saying User Timing doesn't require skill, both modes require skill. You're the one saying Real Player % takes the skill out of the game and I was telling you why it doesn't. The simple fact is that using User Timing with or without shot meter enabled is much easier to score. Sure you can potentially make a super late released shot with Real Player % but who shoots like that? I still release my shots at the pinnacle as if I was using User Timing because it's just natural to do so. Therefore I'm doing the same exact thing you are except I have an extra obstacle called RNG (Random Number Generator). This means that no matter how perfectly you release your shot you can still miss it regardless of being guarded or wide open; whereas the opposite is not true, if you shoot perfectly with User Timing it's almost certain to go in unless you're blocked. Therefore you end up making significantly more shots, raising your overall shooting percentage to unrealistic heights. That's fine if you've tried both and ended up around the same numbers, but for me personally it's not even close, I shoot way too high of percentages and it makes games way too easy to win. I used to be a professional raider in the MMO scene, so for me I absolutely love the mechanics and game of chance that comes with true RNG. Sure it can get frustrating at times, missing shots that you probably shouldn't, but in the end game it keeps the percentage realistic and that's what I'm here for. I'm an extremely good 2K player to the point I have to use these sliders and Real Player % RNG to give myself a handicap or I will win every single AI game I play. Many times in the past I've had to handicap myself even more than Shady's sliders so I can actually have a challenging game. I've been playing a basketball game every year since NBA Live 95 so I've been around this block for a while now. I apologize if for some reason you took my post as a personal attack because it wasn't, but it seems like you did. You play your game your way, I'll play my way. I said it "takes skill out of the game, it makes the skill gap much smaller" and I stand by that. It takes SOME skill out of the game, not all of it. You said it doesn't take the skill out "at all", which isn't true. I contested your original claim that somehow more skill (knowledge) is needed by using real player %, but in fact that's not true at all, because you have to know who shoots well and who doesn't regardless of which setting you choose, and with timing you also have to time it (know the players shooting form). It also seems like you are generalizing about the shot meter, but I could be wrong. Meaning I feel like you think that anybody who is using timing is using a shot meter, that's not the case at all. Myself and two brothers have never used it, but we have always selected (timing" as we felt real player % took the fun and competitiveness out of the competition. When competing, we want control over our destiny. I never said people couldn't play how they wanted, I'm glad you enjoy the game that way. But again, it takes some of the skill out of the game. Shadymike has a better game to work with this year sliders wise, because the blow by issue that was in fixable in 2K18 isn't in this game. So, his services could be valuable here. If you knew how RNG works this wouldn't even be a discussion. Let me break it down for you; both User Timing & Real Player % are affected by player ratings, who is guarding them and how open they are or are not. Yes this is true, however it goes a step further with Real Player %. For example say a player has an RNG of 60% (pretty high but I'm using this assuming it's a very good shooter) to make a wide open shot. Now add in a defender dropping it to 50%. Now let's say this defender is smothering you dropping it to 40%, then there's the factor of the defenders badges and ratings that could cripple your shot even more, someone like Kawhi and thus dropping your shot to 30%. So even with a very skilled shooter in this situation you're most likely not going to make this shot, this is where the knowledge steps in and being wary of your chances at all times. User Timing is also affected this way, it will make the green bar smaller. However the difference is, whether using shot meter or not, if you still hit within that green on your release you will still make that shot. No matter who is guarding you or how smothering they are. It's not very hard to time a shot correctly, generally it's the apex of the shot regardless of who it is, so you don't need the meter to know that. In both modes in this situation you're considerably more likely to score via a well timed shot compared to only having a flat 30% chance. Here's where it gets really deep though and why you have to be cautious of who is taking your shots. Let's say someone like Andre Roberson is shooting a 3. His RNG for a wide open shot may only be about 30% to begin with. So without even defending he's rarely going to make his shots. While with User Timing, even as small as the window is, you will always make more than 30% of your shots unless you simply aren't trying. So right out the gate you're far more handicapped with Real Player %. Now with adding in a good smothering defender he may drop below 10% making it a next to impossible shot to make. Those of us who have used Real Player % for a long time know that this is true, trying to shoot with someone like Roberson while being smothered is practically an impossible shot and it's pointless to even try (hence the knowledge factor). Again yes this affects the User Timing too, making a small window even smaller, but it's still easier to land in that window than it is to make a 0~10% RNG shot chance. The players sweet spot is the same regardless of how big the window is or not, if you can master the players apex then it completely negates the defensive mechanics which is why I call it cheese. I understand what you're trying to say though, you feel like in the moment it's harder to focus on getting the correct release and when you do it's more satisfying. I'm not denying that, it does take skill. You do still need to be aware of who you are shooting with and who is guarding you, but it's simply not as prevalent as with Real Player %. The reason I brought up my MMO experience is because it works the same way. Let's say a boss has a set of mechanics but no RNG factors. Once you master those mechanics it becomes a cake-walk or as we call it a "farm". As long as you work within those mechanics you will win every time without fail. However if it's a boss with added in RNG mechanics then no matter what you do, how flawlessly you play there's always that chance you just simply can get screwed. That to me is more fun because I love that chance of failure, it adds some threat to the game which in return makes it more fun. 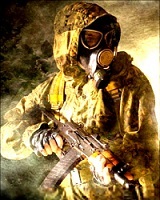 If there is no threat then it gets dull very quickly. So that is my experience with User Timing, it's challenging at first but once you learn your players apex it becomes very easy to score despite the games built in defensive mechanics. But with Real Player % I know in the back of my mind, no matter how good of a shooter I'm using, no matter how wide open I am, I can still miss that shot. That's satisfying to me because it's more realistic and that's what I'm here for is realism. There is no such thing as User Timing in real life. Even if you perfect your form there will always be chances you miss your shots, this is simply reality. The same can't be said for in the game. If you master your players form in the game you will make around 70% of your shots, and that's being generous. I didn't think I would have to get this technical to break it down, to me this is common logic. Yes it takes the timing skill out of the game, but it adds in a whole plethora of new factors to consider. Factors in which I believe outweigh the boon of negating the timing factor. Though personally I still time my shots regardless if it being necessary because it just feels right/smooth. I'm not going to argue with a brick wall, you're set in your ways so even with this breakdown you will still argue against it. But despite that I wanted to write this out for others as well to explain the major differences because a lot of people wonder which is better. User Timing - Requires learning a players apex, then rinse & repeat. Real Player % - Requires being wary of RNG, what factors lower your RNG and thus making a logical choice to shoot or not. Vicerex wrote: If you knew how RNG works this wouldn't even be a discussion. Everything you stated I understand, but we are going to disagree about timing in "real life". FYI, I am also an MMO player, and RPG wise I've been playing them since Dragon Warrior for the NES. With user timing, you still have to measure space, you still have to know who can shoot and who cant, while also having to know the form and timing. Again, we are absolutely going to disagree. I consider real player % as something that takes away some skill involved (For the reasons I stated) and you believe that it doesn't. I'll continue playing my way, and you will continue playing yours, which is fine. However, for nostalgia reasons. This is one of my favorite RPGs of all time. Shady's sliders are pretty decent, better than default, but I think CPU steals are too high. They get at least 6-8 per game, and their shot making is also ridiculous. I mean, all wide open looks aren't suppose to go in. The on ball steals? I definitely noticed a new aggressiveness for on ball steals this year in 2K19. Especially if you're against someone like Chris Paul, he will literally try to go for a steal almost every single time you bring it up the court. I actually had to change my game up a little and avoid him. But then if you go against someone like De'Aaron Fox he rarely goes for a steal at all. They seem to really do a good job at individual tendencies this year. I'm on the fence on this one, on one hand the steal attempts, especially against certain players, are annoying. But it does bump the overall user turnovers to a good level. In past games I always felt there wasn't enough user turnovers. Hey guys just got my PC set up in my new apartment and I'm going to get back to testing...there's some good discussion going on in this thread though.....a few thoughts going forward on the set...I've always actually thought that Real % required more "skill" because you have to KNOW your players ratings / hot zones and can't just rely on a cheesy meter to hit shots the player couldn't make in real life. However that's jut me! My sliders will work with shot stick timing as well they will just need a few tweaks. As for fouls they are super broken so I'm not going to stress that, but yes as all of you guys have reported the CPU FG% has GOTTA come down! I have some things in mind for that! As for the CPU stealing the ball this is user preference but I personally love the aggressive on-ball defense from the CPU....this year you HAVE to use the "protect basketball" mechanic when you are in front of elite defenders...its' a nice touch that I love but feel free to bump up the user "Ball security" slider if it bothers you! Shady, I don't use the shot meter. It's off, and I have it set to timing. You STILL have to know your players and your ratings. It's makes a huge difference, in a addition you have to time the shot. ShadyMikeGaming wrote: As for the CPU stealing the ball this is user preference but I personally love the aggressive on-ball defense from the CPU....this year you HAVE to use the "protect basketball" mechanic when you are in front of elite defenders...its' a nice touch that I love but feel free to bump up the user "Ball security" slider if it bothers you! I agree! At first it was annoying but if you protect the ball you'll be fine. It definitely adds a new element and the more I play and get used to it, the more I like it. Also not only does CPU FG% need to come down, but I think USER FG% might need a bump. I'm missing a lot, I mean a lot, of wide open shots with good shooters. Post isn't too horrible, Mid could use a slight bump, but user 3pt FG% for me has been atrocious. As I'm typing this I just finished a game where I shot 17% from 3 as a team. Oladipo went 0/7, Josh Hart went 1/9, Jeff Green 1/4, Sabonis 0/3, Royce O'Neale 0/4. I realize Green, Sabonis & O'Neale are only mediocre shooters, but both Hart & Oladipo are A-rated 3pt shooters, they should not be going a combined 1/16 especially considering over half of those were wide open. Needless to say I'm really struggling to win games, my low FG% mixed with the CPU high FG%, it doesn't matter how good you play if your shots don't go in you're just going to lose. I'm testing this out right now....give it a run and let me know how it progresses....after I get the FG %'s in check I'm moving on to player movement! This is after changing the sliders to 40/60 as you suggested. 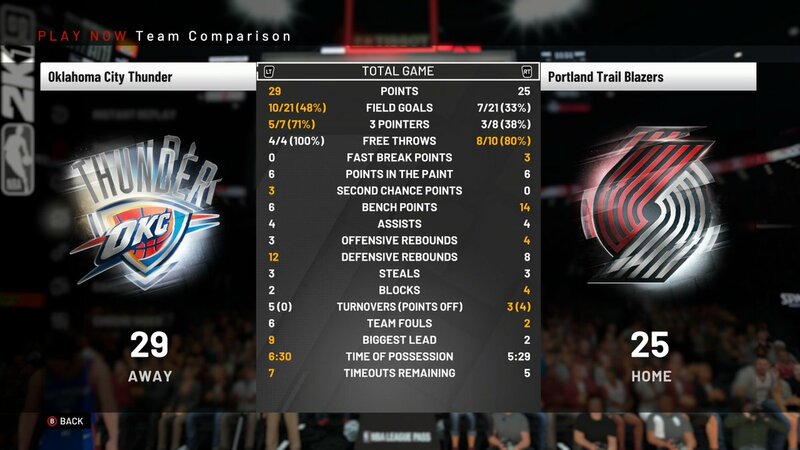 As you can see the CPU is shooting more realistically now at 49%. 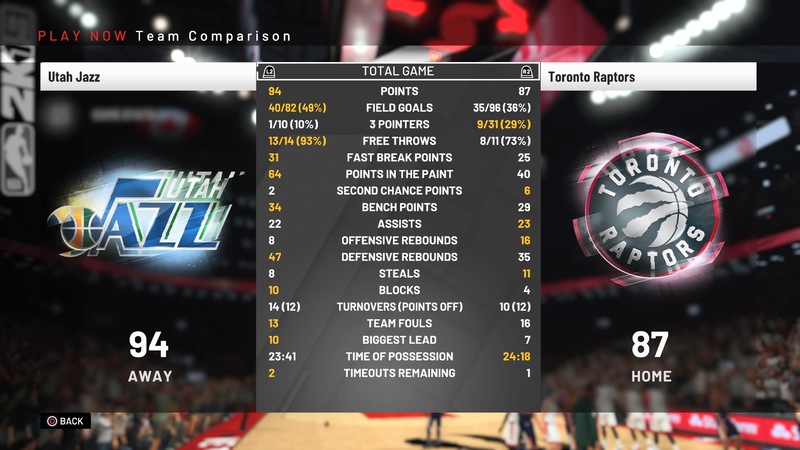 However mines still pretty low (I was the Raptors by the way). It definitely helped me make shots while being closely guarded, but I'm still missing several wide open shots. Another thing I noticed is how little 3's the CPU took. Only 10 the whole game? In the 3pt dominated NBA we have now days that's just not realistic. They had 64 points in the paint (PITP) which is a lot. For example, the league leader in PITP last year in the NBA was the Pelicans with 52 and the league average was more around 44. On the bright side the fouls and turnovers for both teams weren't too bad for a change. I think even with this slider change the CPU could use a small nerf in shooting sliders. User could use a decent boost in shooting sliders. As far as tendencies go the CPU should definitely be shooting more 3's, but you may not even be into the tendencies yet so that can wait. Hey Shady! Great Work again! Much appreciation for the effort. I always use your Sliders. I also looked into Dee4Three's Sliders. Seems great too. Do you think you can use his sliders too? Maybe Combine with yours?